By now, we are all aware that up until about 200 years ago, beauty treatments contained a wide variety of deadly chemicals: lead-infused foundation, arsenic for hair removal, bromine lipstick, and mercury for radiant skin. 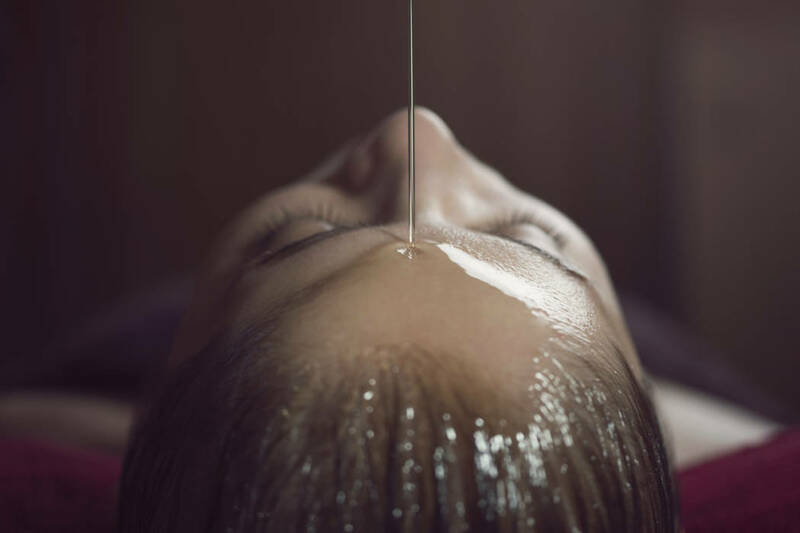 Today, we know that all of these chemicals are poisonous, but that hasn’t stopped entrepreneurs from marketing the weirdest, scariest, most torturous beauty procedures. 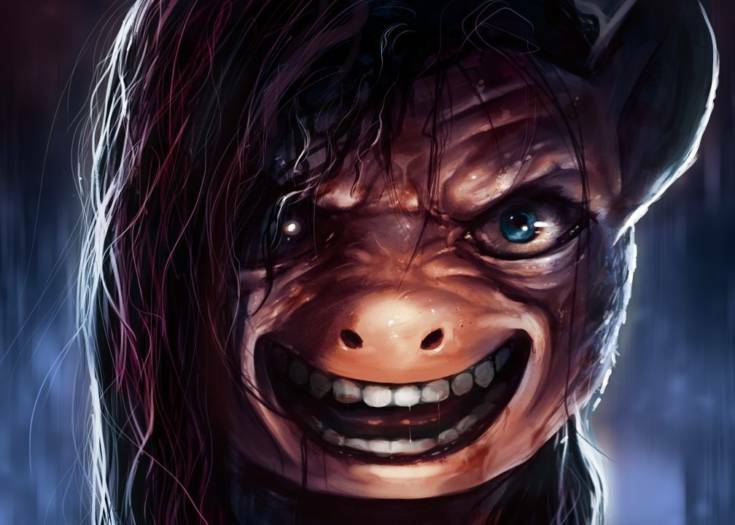 Here are some of the strangest. In 1899, doctors offered eyelash transplants for those who wanted a more doe-eyed look. Unlike eyelash extensions of today (in which silk lashes are gently attached to existing lashes), transplants were a full-out medical procedure. 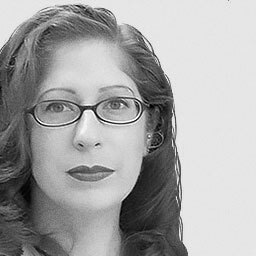 A doctor would numb the eye with cocaine, then thread a needle with hair from your head. The hair would be threaded along your lash line in little loops – essentially sewing hair along your eyelid. Several passes would be required, and then the hairs must be cut and styled. Usually it would require multiple sessions to complete the entire look, and eyes must be bandaged for at least a day after each treatment. The garra rufa, or “the doctor fish” has long been used in spa therapies in the Middle East, but in the last few years, these little fish have swum into American salons. These tiny, toothless fish feed on dead skin. You dip your feet into a tub with a hundred or so of these little fish, and they will gnaw off the dead, calloused skin. They won’t eat the living skin because they have no teeth, and most describe the experience as ticklish. Still, you are feeding your skin to living fish. “A face-fitting spring carrying two tiny knobs, which press into the cheeks.” Frankly, it’s not the craziest thing I have ever heard of, but it doesn’t look very comfortable. 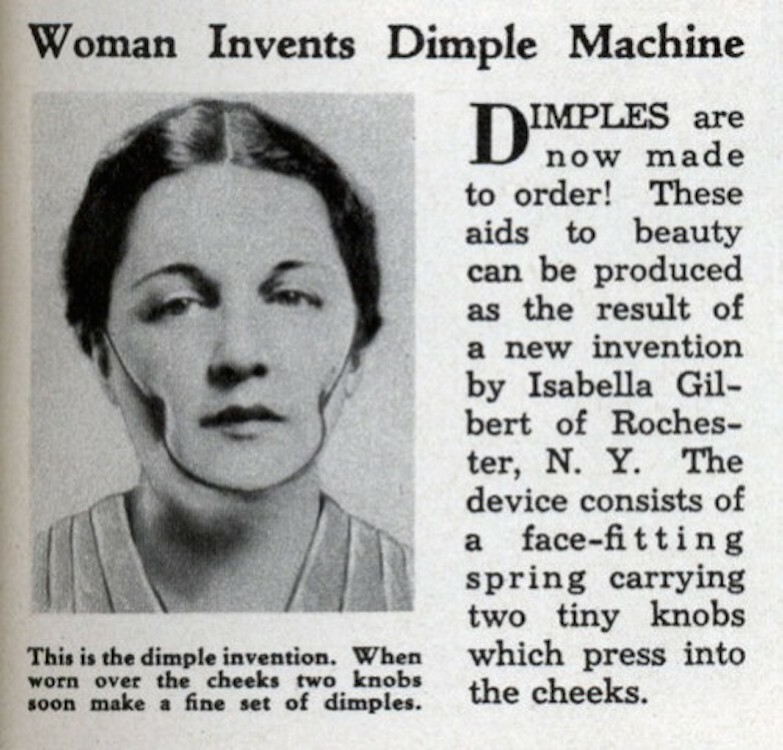 There is no information on how long you would have to wear the dimple machine. I am guessing overnight. And something tells me your new dimples won’t last all day. Can you imagine the little dimples just popping out in the middle of the day? What if it leaves bruises? Mrs. D. M. Ackerman believed that reduced air pressure was the key to a beautiful complexion. 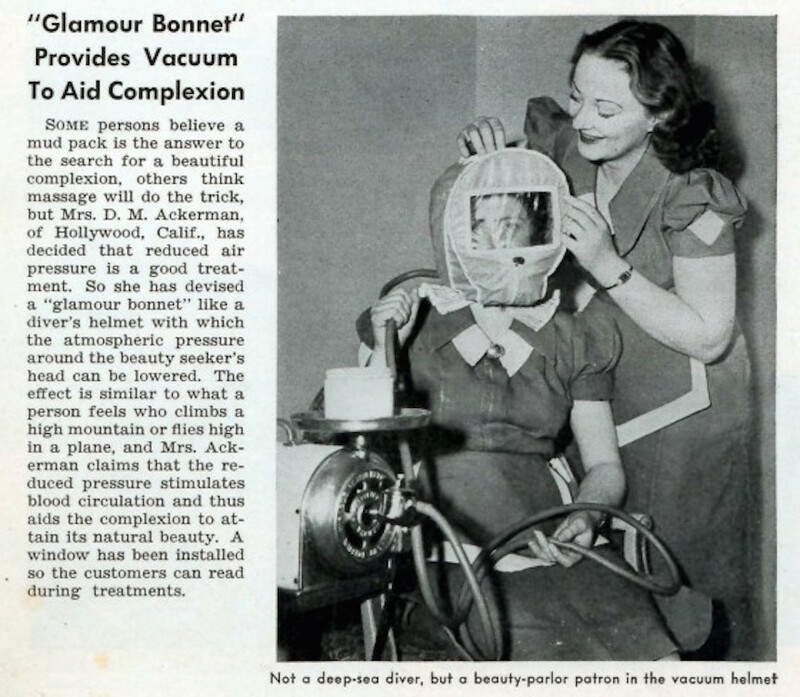 So she created the “Glamour Bonnet,” which would lower the “atmospheric pressure around the beauty seeker’s head.” In other words, it’s an asphyxia hood. The ad promises that it is no different than the air quality on the top of a high mountain, but that’s why mountain climbers usually bring oxygen canisters. On the plus side, there is a plastic “window” in the bonnet, allowing the woman to read while she is inside. Well, until she passes out. Huǒ liáo, or “fire facial” is apparently common in China. A towel is soaked in a “secret elixir,” then placed on the skin. Some alcohol is added as a “starter fluid,” and the towel is set on fire for a few seconds. It is supposed to stimulate the skin and address skin problems like dullness, wrinkles, and sagging. This doesn’t seem so scary on your back or legs, but on the face? No thank you. Let’s ignore the fact that this mask has the creepy, expressionless look of many a serial killer’s mask and focus on the horrors within this thing. 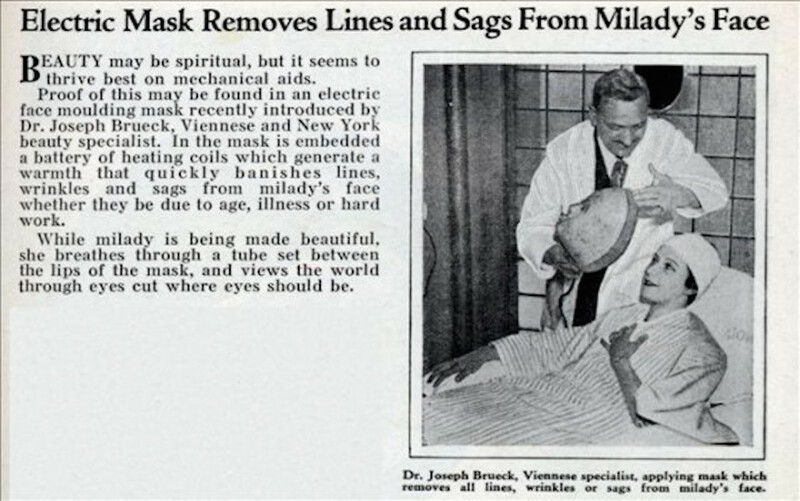 It is lined with a “battery of heating coils” that will banish lines, wrinkles and sags from your face. It doesn’t bother to mention that they will be gone because several layers of skin will be burned off. The wearer will breathe through a tube, and the mask has eyeholes cut out, presumably so you can see everyone who is laughing at you. The cherry on the creepy sundae is that the word “milady” is used multiple times in this very short news clipping. Developed by Hollywood makeup legend Max Factor, the beauty micrometer looks worse than it actually is – physically. Its purpose is still monstrously hurtful. With over 300 points of adjustment, the beauty micrometer is designed to pinpoint physical “flaws” that might be invisible to the naked eye, but may pop up on film. This way, a trained makeup technician can hide the flaw. I see nothing but a SAW trap.